Regulators have told Bank of America Corp. and Citigroup Inc. that the banks may need to raise more capital based on early results of the government’s so-called stress tests of lenders, according to people familiar with the situation. 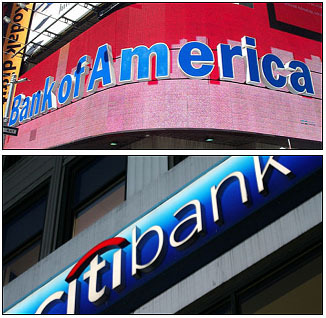 ….Bank of America’s capital hole as measured by the regulators is in the billions, said people close to the company….It isn’t clear how big a capital deficit Citigroup faces. Well, I’ll bet that Citi’s capital requirements are “in the billions” too. What else would they be in, after all? In any case, there’s no way that either bank can raise private capital, and the Treasury has stated flatly that it won’t allow them to fail. That means either another big capital injection from the feds or else some kind of guarantee to private investors. The former would almost certainly have to be at market rates (I doubt there’s any appetite for more sweetheart deals) and the latter would be such a thin veneer that it’s almost certainly impossible to pull off. Especially in the case of Citi, then, it’s hard to see how the government ends up anything other than a majority owner of the bank once this is all over. Tim Geithner can call this anything he wants, but that’s nationalization whether he likes it or not.